Builder McLearon, W B, Harwich. ENA is a wooden barge, built of pitch pine on oak frames, using carvel construction. She was fitted with leeboards and the traditional keelson and rigged as a mulie, with a sprit mainsail and a gaff mizzen. This arrangement combined the handling ability of a spritsail barge with the load capacity of a ketch; her cargo capacity was about 150 tons of grain. ENA was well maintained between the two World Wars by her owners. She worked entirely under sail until 1948 when a Ruston diesel engine was fitted. She traded as a motor barge until 1974 when she was restored to sail. New sails were fitted and a Gardner diesel replaced the Ruston unit. Much of the gear needed to get ENAsailing again was found lying about the shipyard since being discarded in the 1940s. In 2001, conservation work commenced, involving replacing the carlings, coamings, main beams, linings, ceiling, the decks, knees, and some frames. ENA was built as a speculation by W. B. McLearon at the Navy Yard, Harwich, and completed in 1906. She was purchased by R. & W. Paul Ltd, grain and agricultural merchants and remained with this company and its successors for the whole of her working life, giving her strong associations to the Ipswich area. She is significant for having remained operational through both World Wars. In the First World War she and the other barges in Paul’s fleet carried supplies to the armies on the continent of Europe. In the Second World War ENA continued to trade in grain between London and Ipswich, or undertook lightering duties on the River Orwell. She gained international significance for her role in the Dunkirk Evacuation in May 1940 when, together with five other Paul’s barges, she was one of sixteen sailing barges which evacuated troops from the beaches as part of Operation Dynamo. In later life, ENA has taken part in a number of returns to Dunkirk to commemorate the anniversary of the evacuation. In the 1980s, ENA was used as a publicity barge for Pauls and attended the European Brewing conventions in London, Maastricht and Helsinki. She has been recorded on the National Register of Historic Vessels since 1996. The primary function of ENA was as a cargo carrying barge. The combination of her flat-bottom, her wooden carvel construction, with leeboards and keelson and her distinctive mulie rig, gave her the handling ability of a spritsail barge with the load capacity of a ketch and she retains these elements today. Her shallow draught was of added benefit for her role during the World Wars, giving her access to shallow waters and making her less likely to be sunk by U boats and mines. Her flat bottom was also ideally suited to the beach work she undertook during the Dunkirk evacuation. Her design and rig allowed her to be operated by only a man and a boy, and her sprit became a useful crane for handling cargo once her sails were stowed. As a spritsail barge with red ochre sails she is elegant, graceful and a pleasing sight when under sail. 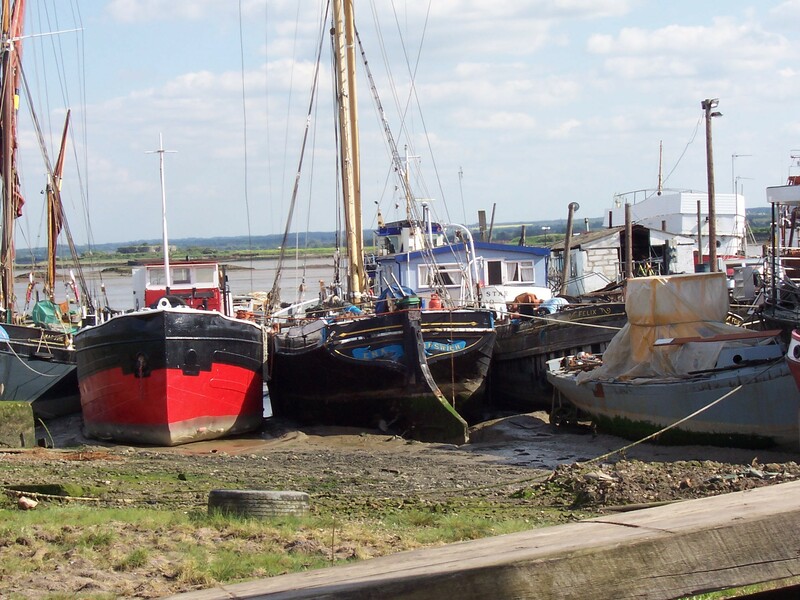 She is currently laid up on the River Medway so, although not operational, she remains in an area which is traditionally home to many barges of her kind. Source: NHS-UK team, 27 October 2016. Built as a speculation by W B McLearon at the Navy Yard slip, Harwich, and completed in 1906, ENA was rigged as a mulie, i.e. with a sprit mainsail and a gaff mizzen. This arrangement was intended to combine the handling ability of a sprittie (spritsail barge) with the load capacity of a boomie (ketch). After completion she was purchased for £875 in 1907 by R & W Paul Ltd, grain and agricultural merchants, who had also bought the yard’s THALATTA (q.v) in the previous year. ENA's mulie rig was erected at Paul’s Dock End Shipyard. For her entire working life ENA was owned by that company or its successors (now part of Harrisons and Crosfield plc). She was built of wood (pitch pine on oak frames) and had a cargo capacity of about 150 tons of grain. In World War I ENA and the other barges in the Paul’s fleet carried supplies to the armies on the continent of Europe. Their shallow draught gave them access to shallow waters and they were less likely to be sunk by mines or U-boats: U-boats were often reluctant to disclose their presence, or even waste a precious torpedo, attacking a mere sailing barge. ENA was well maintained at Paul’s own yard between the two world wars and continued to take the company’s own cargoes, and she was thus largely immune to the effects of the depression. In World War II she continued to trade in grain between London and the Ipswich, or lightering on the River Orwell, and also carried sugar beet. In May 1940, together with five others of Paul’s barges, carrying a load of petrol in cans, she was amongst the sixteen sailing barges which sailed to Dunkirk to evacuate troops from the beaches as part of Operation Dynamo. During the crossing they endured constant air attacks. Finally Harold ‘Titch’ Page, her skipper, was ordered to beach her close to the barge H.A.C, and the crews of both barges were told to abandon her and escape on a minesweeper to England. However both barges were spotted by troops and sailed back to England under constant enemy bombardment and machine-gun fire. Aboard ENA were Lt Colonel W G Mc Kay and men of the 19th Field Regiment, Royal Artillery, but there were no sailors to assist them. They made it to the Kent coast where they were spotted near the South Goodwin light vessel at 8pm on 2 June by the Watkins tug KENIA and taken in tow to Margate. ENA's skipper, Alfred Page, who had assumed the barge lost, was surprised to be sent from Ipswich to recover her. ENA worked under sail alone until 1948 when she was converted to a motor barge with a Ruston diesel engine, and continued to trade until 1974. She was then restored to sail and retained by the company (which by then was known as Pauls & Sandars) for corporate hospitality. New sails were made by Gerry Whitmore, and a Gardner diesel (which had done 300,000 miles in one of the company’s lorries) replaced the Ruston unit. ENA was re-rigged by Charlie Webb, her last master in trade, and Harold Smy, whilst the work on the hull was entrusted to the company’s Dock End shipyard. Much of the gear needed to get Ena sailing again was found ‘lying about’ in the shipyard since being discarded in the 1940s. Harold Smy became her new master, and was succeeded by Len Polley and then his brother Tom Polley; over a period of more than 25 years Ena took parties of brewers to many barge matches. Skippered by Brian Pinner she also sailed to Copenhagen, Amsterdam, and Brussels, and many times to Dunkirk for reunions. When the owners (then known as Pauls Malt) were taken over by an Irish company Ena was deemed surplus to requirements. In 2001 she was sold to Luke Deards and after that season was taken in hand at Stargate Marine (at Hoo, on the Medway) for restoration work which lasted a year and involved replacing the carlings, coamings, main beams, linings, ceiling, the decks, knees, and some frames. She then resumed chartering under Marine Events Management, but is now laid up at Hoo on the River Medway.